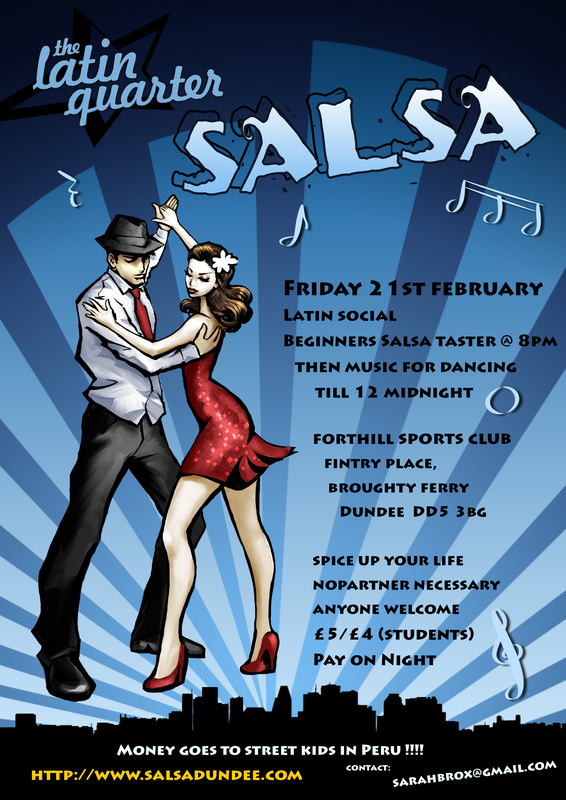 Latin Quarter social – Friday 21st February, Forthill Sports Club (function suite), Fintry Place, Broughty Ferry, DD5 3BG, see directions below & google map. Doors open at 8pm with a beginners taster salsa class followed by music & dancing till 12 midnight. Entry to social £5/£4 (students), pay on door. Anyone welcome, bring friends & family, no partner necessary. Come & spice up your life with some latin spirit & help raise money for Azul Wasi, home for former street children at the same time. Please pass this on or pop a poster up if you can. From bottom road from dundee towards broughty ferry, turn up forthill road , go up hill then take right turn onto Fintry Place, when see scholl on your left turn right down small road, signposted to sports centre on fence, follow road around to right, continue & park. Building is to right hand side & upstairs ( not sports centre on left side).